Yes, there is one there if you look carefully. Abwal the birds are sooooooooooooooooooo cute I love them..............are they Chinese Forget me nots??? Love your birds Ab, great shot and very lovely. 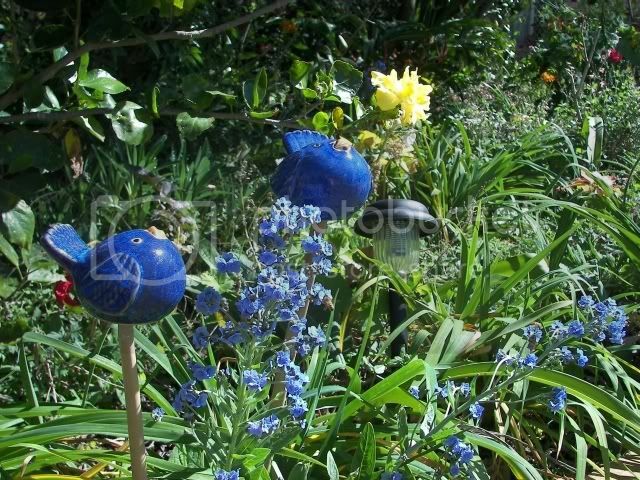 Very pretty and excellent combination with your forget me nots. And don't they set off the blue of the flowers?! I found him without too much trouble, but then I can spot an aphid at a hundred paces! Pam wrote: I found him without too much trouble, but then I can spot an aphid at a hundred paces! No, it's just an affliction. Not really! I find myself absent-mindedly squashing other people's aphids, and then feel terribly embarrassed.